Accessing, sharing, and delivering social media involve online user-to-user social interactions. These interactions can be characterised by one-to-many or many-to-many communications established amongst numerous users. This in turn makes the whole environment a very heterogeneous one, comprising diverse user devices, fixed and mobile access network technologies, content representation formats, user needs and preferences, and media usage and consumption environment characteristics. Owing to this very heterogeneous nature of social media access, personalised access to the social media is a significant challenge for maximising the user experience and satisfaction. 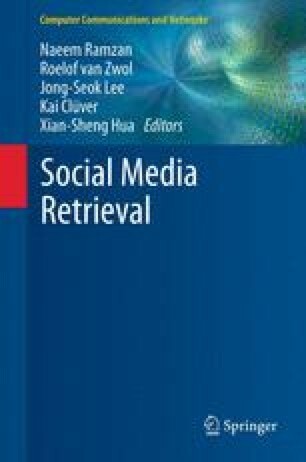 This chapter presents context-aware social media content adaptation as the key technology to address this challenge. It introduces the importance of context awareness in personalised social media access, and how it can be coupled with content adaptation and adaptation decision-taking mechanisms to provide a complete solution for both the technical and non-technical (i.e. social) challenges faced. Detailed discussions focus on describing various adaptation and decision-taking types and operations while also pointing at a number of open issues for future research, so as to address those highlighted challenges for realising true personalised social media access environments. The authors would like to thank their past and present I-Lab colleagues as well as the partners of the EU-sponsored collaborative research projects, particularly those participated in VISNET II NoE, who provided the inspirations for composing some of the discussions presented in this chapter.